You can carry the gold theme even further with your favour boxes, and here’s how. Gold paper boxes are a perfectly fine way to wrap up a tiny treat for your guests and a thank you for helping you celebrate one of the most important events of your life. Metallic gold laminate covers the outside of the box, giving it a luxe feel, but the cardstock is the real hero in these boxes. Cardstock is pliable enough to fold into interesting shapes like pyramids and pillows. Tiny gold boxes like these are usually the right size for Jordan almonds, a few chocolate kisses, or other small confectioner’s treats. If a you like keeping the gold toned down a little, consider favor boxes covered in a fabric of your favorite color. Or you could try gold lace over a white or cream coloured fabric. Accent the box with a gold tassel or a brooch with stones set in a gold base. Even a simple gold ribbon around a plain box is enough to do the trick. Often it’s the little touches like a carefully placed accents that ties everything together and creates a unifying theme. Perhaps the most impressive use of gold is accomplished when covering the favour box with prestigious gold dyed Dupioni silk. The exquisite luster tells your guests that they are in for a remarkable treat, especially when the box has been embellished with satin ribbon and a pearl and rhinestone brooch. Imagine lifting the lid of liquid sunshine to see the treat inside. Gold is the standard of excellence, and everyone knows it. Your celebration should set the bar high – select gold, and you will. 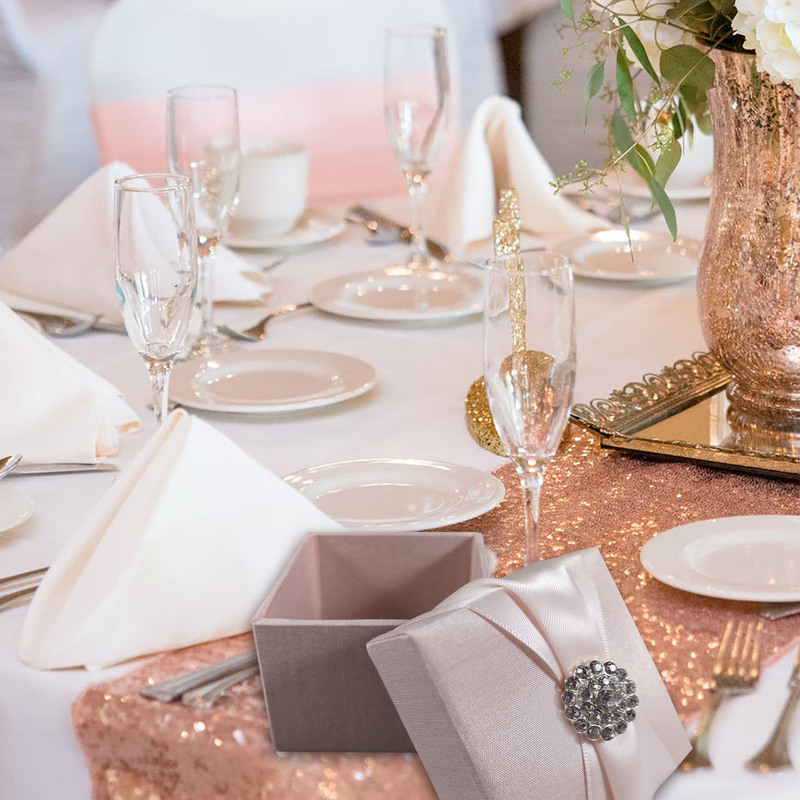 Incorporating gold into your celebration is easy if you select favour boxes that carry the theme of excellence through, from invitation to favour.